Since ancient Rome, concrete has been cast in rigid moulds. Casting concrete in light, flexible, fabric containers utterly transforms concrete from the brutal and rigid material we have come to know, into a sensual and sensitive material, alive to its original wetness and plasticity. This section of the website contains images of numerous examples of concrete cast in moulds made of simple flat sheets of fabric. Full-scale constructions are found under the Fabric Formwork Construction tab. You will also find a separate section on fabric formwork models, and one containing Resources and links to other articles and websites about flexible formworks. ​ Other, more complex flexible formwork methods, such as inflatable formworks, are not included on this website. However references to the broader range of flexible forming techniques can be found under the Resources tab. FOR MORE DETAILED INFORMATION on fabric formwork, see the Resources tab at the end of this section. 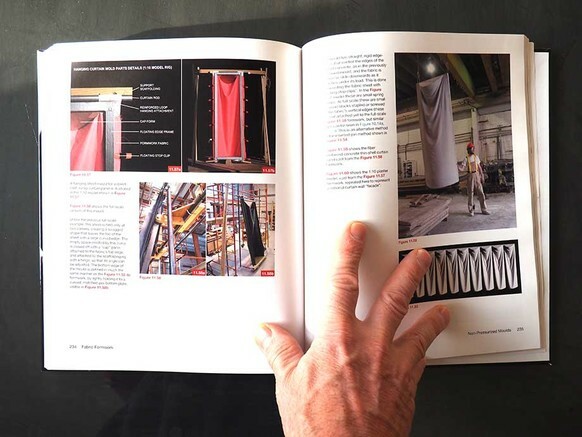 Also, see The Fabric Formwork Book, by Mark West -- the first and only comprehensive guide to fabric formwork methods and applications. It contains specific How-To information and instructions, as well as chapters on the history and structural implications of forming concrete structures in flexible moulds using simple flat sheets of fabric. ​Much of the work illustrated in this section of the website is from Mark West's fabric formwork research at the University of Manitoba's Centre for Architectural Structures and Technology (CAST). This work received generous support from: Canada Foundation for Innovation (CFI) The Social Sciences and Humanities Research Council of Canada (SSHRC), the University of Manitoba, and Lafarge Building Materials Group, Winnipeg. Ronnie Araya, CAST Research Associate for many years, was a key contributor to this work. Many students also assisted in this research -- too many to name individually. However, the following former students played particularly important roles in this work (listed alphabetically): Aleksandra Chomik; Leif Friggstad; Fariborz Hashemian; Aynslee Hurdal; Kyle Martens; Sean Sinclair; and Chris Weibe.